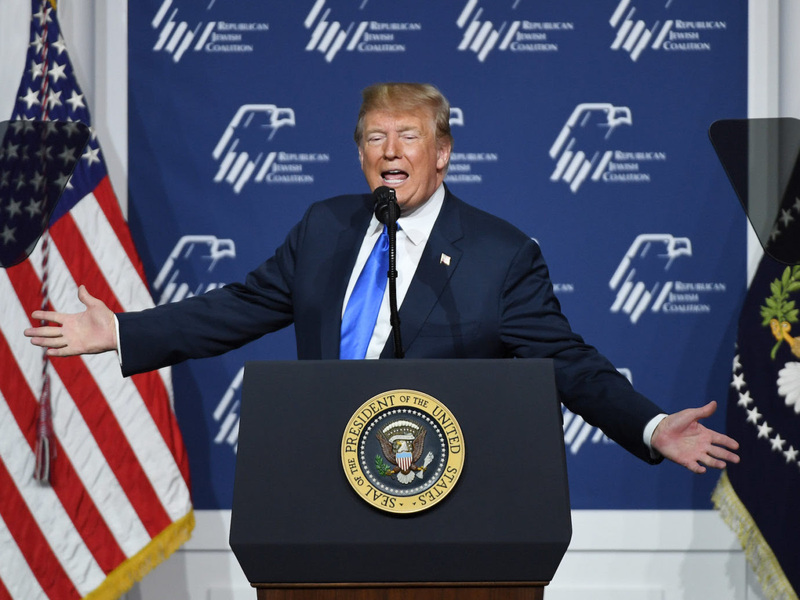 President Donald Trump questioned traditional Jewish support for Democrats in a stem-winding speech to Jewish Republicans. “How did you support President Obama, how did you support the Democrats?” Trump said Saturday addressing the annual Republican Jewish Coalition conference in Las Vegas. “We didn’t,” the crowd replied, twice. “You guys didn’t, probably you guys in this room didn’t,” he said. Jewish voters have for decades favored Democrats in elections, usually by substantial majorities of about 70 percent. Trump received a hero’s welcome, with speaker after speaker noting his shifts in Israel policy, accommodating the hawkish policies of Israeli Prime Minister Benjamin Netanyahu. Among Trump’s policy changes popular with this crowd: Moving the U.S. embassy to Jerusalem, pulling the United States out of the Iran nuclear deal, ending U.S. funding for Palestinians and recognizing Israeli sovereignty over the Golan Heights. The last time Trump spoke with the RJC, at a candidates’ forum in 2015, it did not go so well. Trump in that forum told Republican Jews he was not popular among them because he could not be bought. Despite the warm welcome, there were awkward moments on Saturday in Trump’s hour-long speech, which he devoted to noting his differences with Democrats. He mocked asylum seekers and said of refugees, “Our country is full, can’t come, I’m sorry,” earning only mild applause. It’s not the first time that Trump has called Netanyahu “your” prime minister in addressing American Jews, and the American Jewish Committee scolded Trump on Twitter. A Democratic congresswoman, Rep. Ilhan Omar, D-Minn. — whom Trump mocked in his speech — has come under fire from Republicans and fellow Democrats for her perceived invocation of the dual loyalty canard. On another occasion, Trump said failing to defeat Democrats in 2020 would endanger Israel — again, using “your.” “If implemented, the Democrats’ radical agenda would destroy our economy cripple our country and very well likely leave Israel all by yourselves,” he said. Vice President Mike Pence also addressed the forum, as did a number of leading GOP lawmakers in Congress.